Services » Computers, WIFI, Fax, Copiers..
Free building-wide WI-FI is available for your PC/Phone/Tablet or other mobile device. The connection is unsecured; no passcode needed. Look for "Middleton Library" in the SSID "connection name". Need to print from your device? Visit www.midlibrary.org/printme and print your document there! The library has two b&w copiers; one on each floor. There is a color copier on the lower level, near the reference desk. The library has a public use fax machine for OUTGOING faxing only. The machine is on the the lower level, near the reference desk. We also offer 8 laptops that can be checked out for in-library use at the Lower Level Reference desk. There are 6 "express" 10 minute stations in the building, as well as 7 stations in the Children's and Teen area. 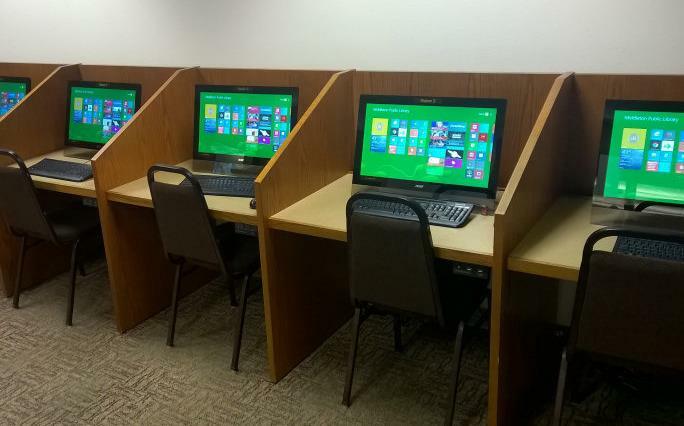 We have two private studyrooms available with computers that can be scheduled in advance. The computer in studyroom B also has a scanner. All stations can print to a Black & White printer at 10 cents per page, or a color printer at 50 cents per page. Our printer system takes bills, coins or a re-usable print vending card. Want to print from your own device? visit www.midlibrary.org/printme and print your document from there!